Many Virtual Assistants do not realize the impact that content planning can have on their business. There are a lot of mental barriers that come up for VAs when it comes to what to put out there, where to put it, and what it’s all for. That can lead to a lot of time wasted thinking about all of these things. And often, it means that Virtual Assistants put the wrong kind of content out for their audience to see. Or worse, they don’t put anything out at all. How many inspirational quote graphics do you post in your social media channels? If they are not relevant to the services you offer your clients, they are not working for you in the way that they can be. The bottom line is that we use content as a means to get clients. If you don’t take the time to plan your content strategy, you can waste a lot of time and effort and see no results whatsoever. 1 - Strategic planning saves you time. 2 - Content goals become clearer. What do you want your audience to do when they see your content online? Knowing your end goal is very important whether you are writing a blog article, recording a video, or creating graphics to post on social media. What do you want them to do? You want them to work with you, that’s for sure. While it’s nice to see email opens and blog comments, you really want them to take action. Tip: Instead of just writing any article for a blog post, plan what you want your people to do and work back from there. Your message will come through much more clearly, and they will know the next step. 3 - Measurable results help you improve what you put out there. When you use content marketing as a means to build your business, you need to make sure that your business is, in fact, building. Using SEO properly in your content helps it get seen better, which is the point of content in the first place. When you build content using keywords and relevant hashtags, you are putting more eyes on it. Are you getting more signups to your list? Are you getting consultations? Are you having conversations with potential clients? If not, your content could use some work. Tip: Choose some keywords that will be the foundation for your marketing message. Don’t underestimate the power of Google and search functions. People want to find what they are looking for. When you choose your SEO pieces effectively, you will be seen. 4 - Consistent messaging positions your expertise. Is your marketing message consistent through all of your marketing? If it’s not, your audience could be confused by your content, making it less effective. Planning helps you to figure out how to sprinkle your main marketing message throughout all of your marketing platforms so your message is the same everywhere. Tip: Use your content plan to select some broad topics and some categories, and develop your content around those. 5 - Reach your audience in a way that makes them respond. Your audience doesn’t always like to consume their content in the same way. Some people prefer short posts, some like video or audio. If you make a plan of what you want to post, you can also plan to produce content in different formats that might be more appealing to some of your audience. Tip: Repurpose blog posts into social media graphics or videos. The more your potential clients hear about your expertise, the more effective it becomes. Remember the whole idea behind sharing content is to get clients. Marketing is all about putting your message in front of your potential clients so that you are top of mind when they need help. Make your content work better for you by making a plan and developing your content around the plan. You will make better use of your time, your audience gets a clearer message, and you can position yourself as the expert in your field. Want to learn more about content planning? 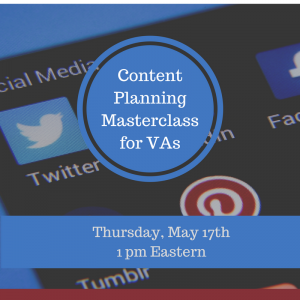 If you want to learn more about content planning and see a demo of a really cool tool to help you manage yours, join us for this Content Planning Masterclass on Thursday May 17th at 1 pm Eastern. Andy Lambert from Content Cal is my special guest for this training class. Read more about the session and register here! A very important part of doing a marketing plan is to also have a marketing calendar. This is where you’ll put in all the important dates and milestones for your action plan – so that you can keep track of what you need to do and when you need to do it. It’s great that you have a marketing calendar but now you need to do a couple more things to make sure it works for you. You don’t want to have wasted your time putting together a marketing plan and calendar if you don’t actually use your calendar! Put your calendar somewhere that you’ll see it every day! Put it on your bulletin board or in a prominent place on your desk. If you use an electronic calendar, make sure it pops up first thing in the morning. You want to be able to see this calendar all the time – as it will be a reminder of the actions you need to take. This calendar is your marketing To Do list and as such, it’s vital you look at it all the time. As well, you can have electronic reminders set up so that you have help remembering the tasks and when there are due! Look ahead – at the next week, month and quarter. When we’re using our calendar as a To Do list we can sometimes keep our nose buried in that particular day. But it’s also good to look ahead at what’s coming up, to see if things need to be shifted or changed. Every Friday I look ahead to the upcoming week so I get a feel for the next week’s activities. I also usually pick one day each month to look forward to the next month and next quarter – to take a look at the bigger picture and also to see if anything needs to be tweaked. Don’t forget to make the corresponding changes in your calendar. It may sound like a lot of work, but believe me – it’s essential to have a marketing calendar and use it daily. You’ll lessen your chances of missing deadlines, double-booking activities and events, sending too many emails out at once – and your stress level!